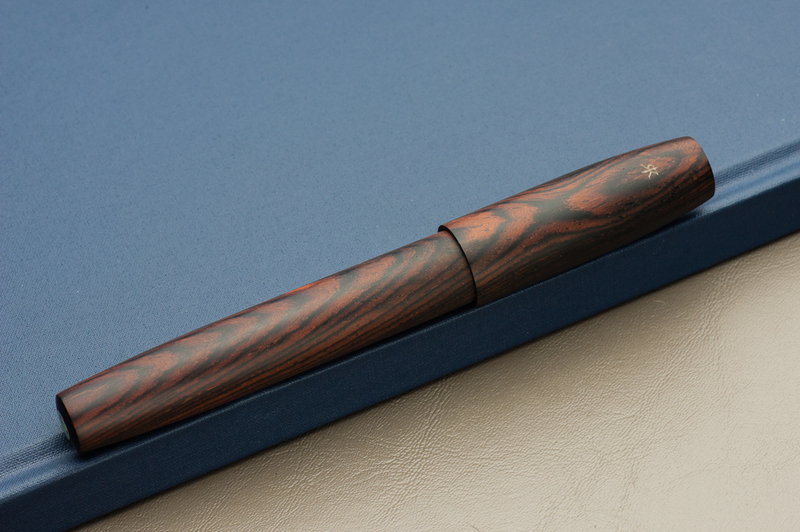 Katherine: It’s late in the month and I’m looking back thinking “What have I written with the most this month?” and the winner, hands down, is this funky combination of a Pelikan with a custom urushi finish by Bokumondoh and a Straits Pen custom ink. Honestly, the Pelikan (originally a M200) holds so much ink that I’m getting a little sick of this purple-ish blue. It’s a lovely color… but after staring at it week after week, I’m ready for something new (good thing May is just around the corner!). First, the pen. 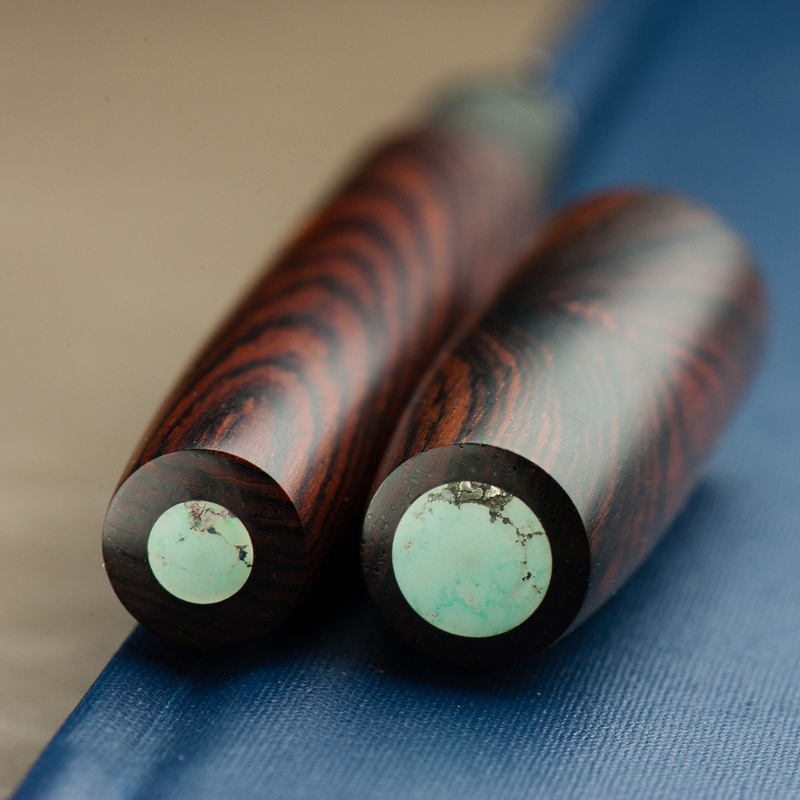 I sent this M200 to Bokumondoh despite her warnings that this particular finish ends up pretty thick. 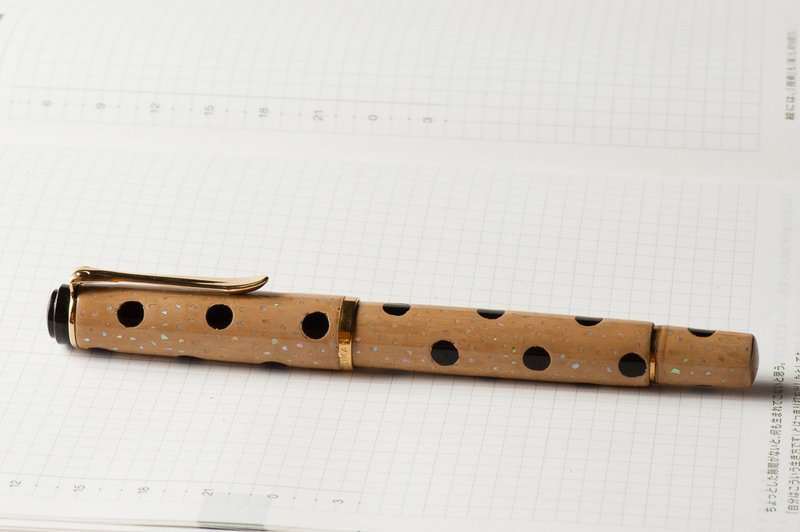 I love the beige and black polka dots, and the sparkle of the raden. It came back about a month later, and the finish is, as promised, quite thick — but the serendipitous thing is that now I can use my M200 as a slip cap. Game changer! I can still thread the cap if I need to, but the barrel is now thick enough that I use it as a slip cap 90% of the time. Second, the ink. This is a custom ink that the folks over at Straits Pen cooked up — it’s a wonderful shade of purple-blue that flows well and dries reasonably quickly. I hope to see it in production soon. 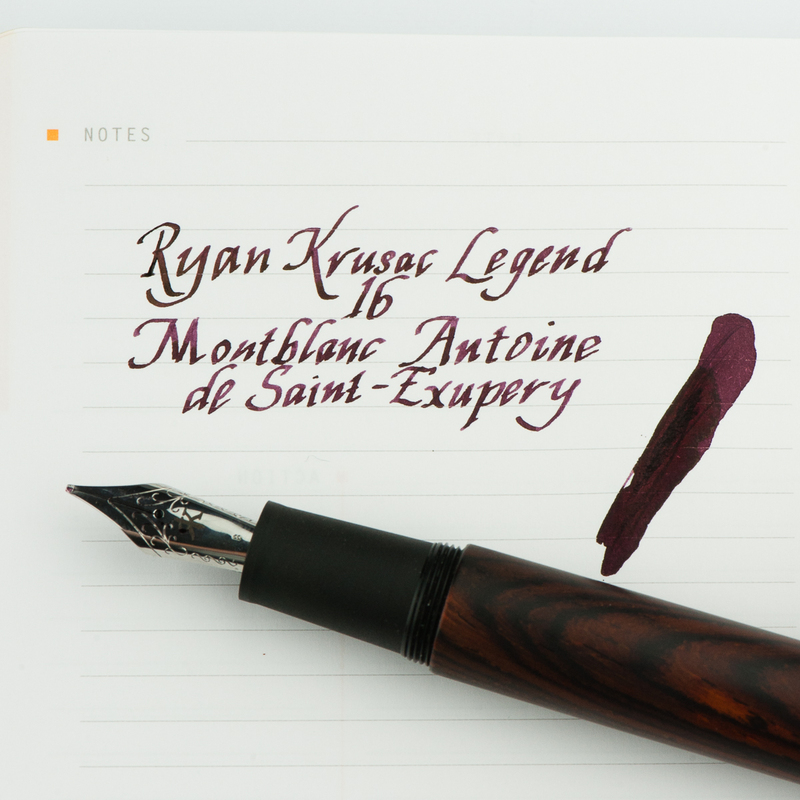 Perhaps at the SF Pen Show? Pam: Thank you Anderson Pens for your ink match up giveaway. 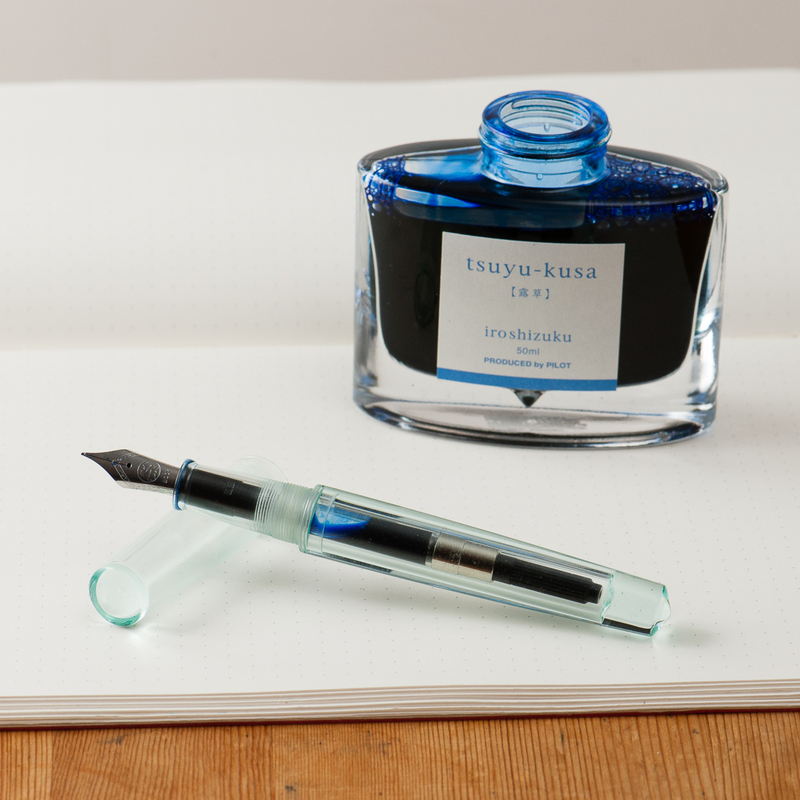 I was a lucky winner of the Pilot Iroshizuku Tsuya-Kusa, a new blue (for me.) I will admit that I have been lax in my admiration of the Pilot Iroshizuku inks as of late, however I plan on rectifying that. 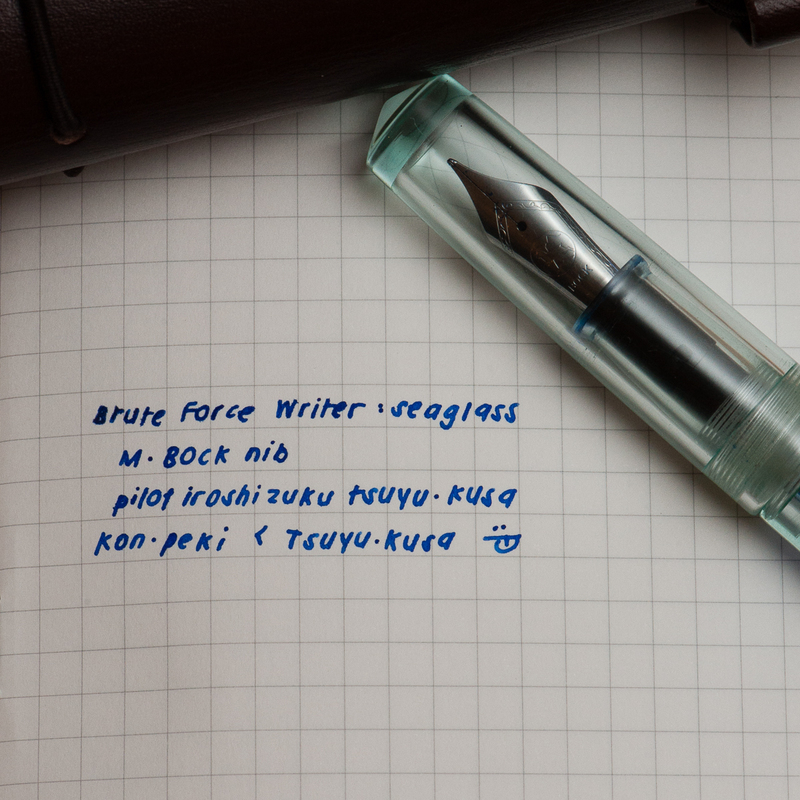 Starting with pairing this beautiful cornflower blue ink with the Brute Force Design Writer in Sea Glass. The beautiful and deep blue of Tsuya-kusa is deeper and more nuanced than a turquoise or sky blue. (That’s right, I said it. 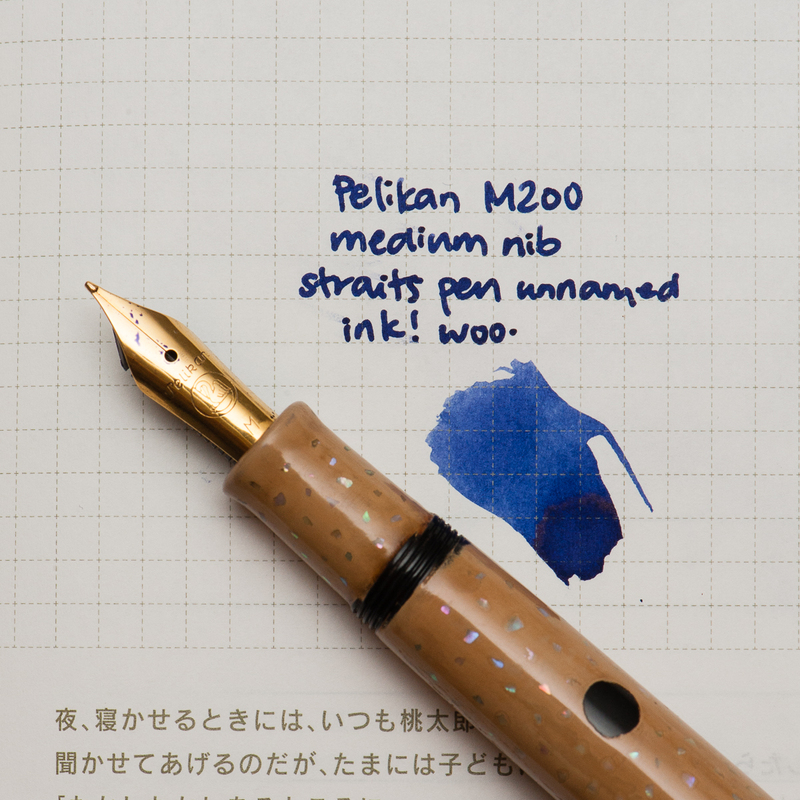 I like it better than Iroshizuku Kon-Peki.) It’s also a warmer blue with more red tones based on my amateur comparison. Creator in Chief behind Brute Force Design, Troy, is a wonderful artist in pairing metals and woods in his signature pen designs. 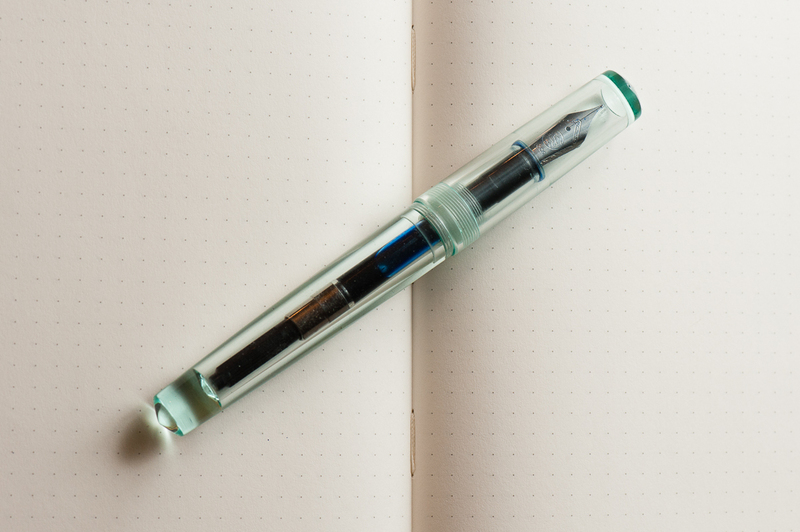 I chose a lighter version of the Writer model due to the beautiful transparency and seafoam green tint of the material. 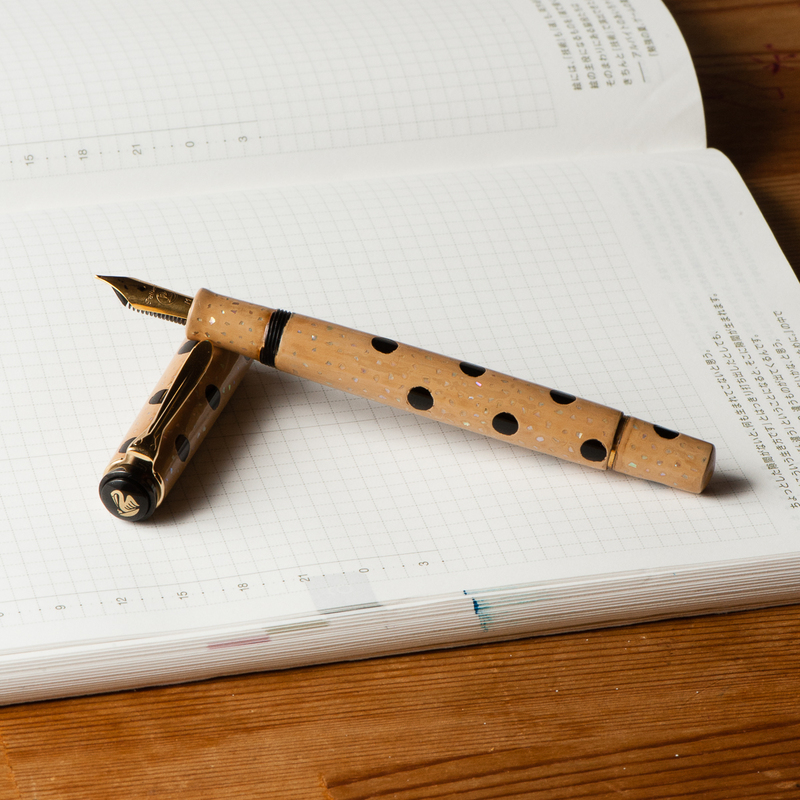 The nib of choice for Brute Force is a Bock nib. The one I have here is really wet and very well displays the color and depth of Tsuya-kusu to the fullest extent. Bring on the spring/summer, world! My inked pens, allergy meds and I are ready for you. As for the MB Saint-Exupéry ink, this was my first time inking a pen with it and the burgundy color is quite rich and has purplish tones. I don’t have many burgundy inks and I find this ink to possess some beautiful shading, and the broad nib brings out the saturation very well. There is no sheen that I can see in the writing which is fine and the flow is very wet. 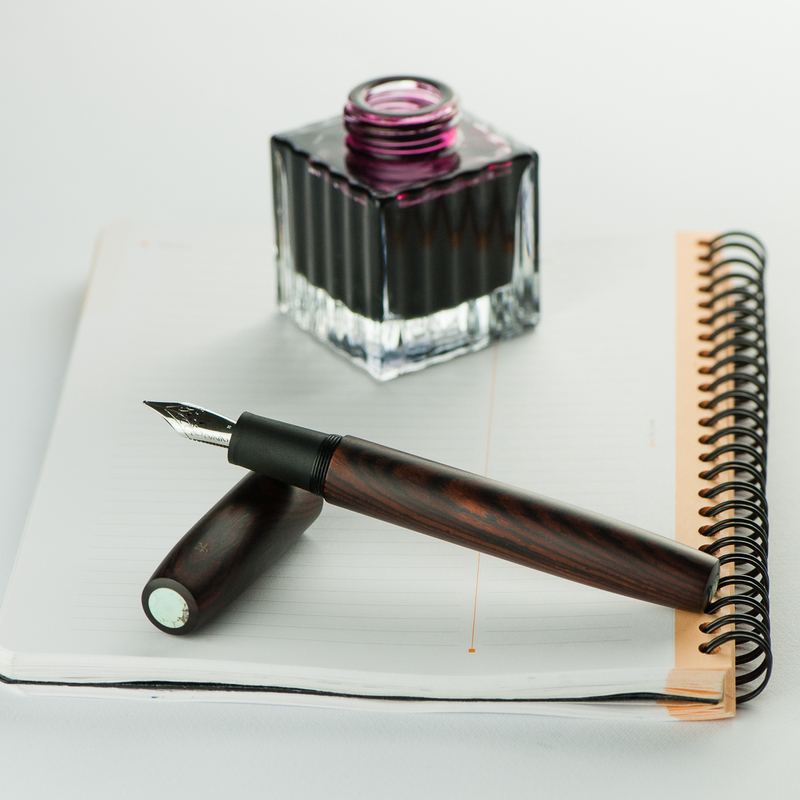 Even if the ink does not match the cocobolo finish of the pen, the ink color complements it well. 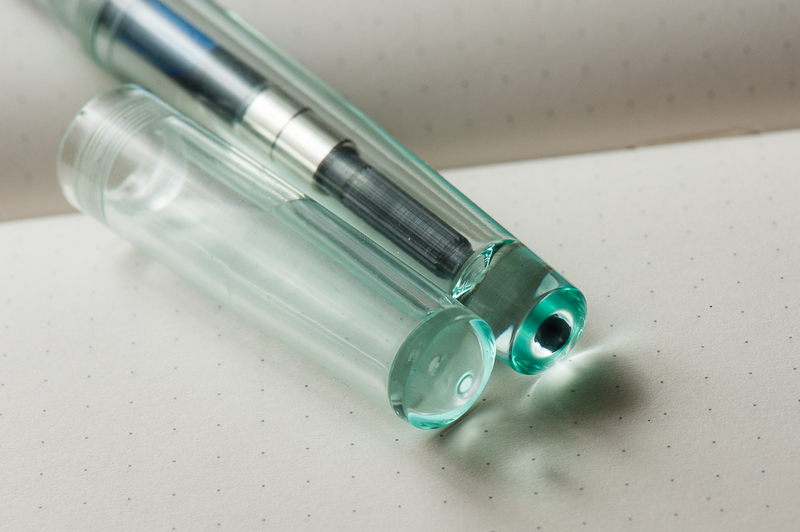 What pens and inks have you written with lately this month?